OLK14Message converter is an advanced utility to convert OLK14message to PST/EML/MSG file format. The lost data of Apple Outlook database file such as OLKMSGSource, OLK14Event, OLK14Attach, OLK14Message, OLK15 can be imported to Outlook PST file format with the help of OLK file converter. With the help of OLK14Message converter users can effortlessly import OLK14Message to Outlook PST and MSG file format. Afterwards, these files can be accessed outside the Mac environment. 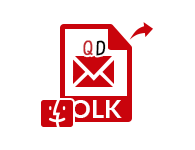 This software provides complete conversion of OLK file without any change in the file. The OLK15 file is created by the new version of Mac Outlook 2016. This file is also a backend database file as OLK14Message. This tool also supports the conversion of OLK15Message files to PST, EML & MSG. Easily convert these files and import in Outlook PST or other email platform without any alteration of original data. The application also supports the other files of OLK such as OLKMSGSource, OLK14Event, and OLK14Attach, etc. OLK14Message converter also exports these data file in PST format. Users can access these files in their Windows Outlook or Machine. It keeps all data intact after the conversion. The users can add single as well as multiple OLK files to the software for OLK14Message conversion. This tool can export unlimited file from OLK14Message to PST ,EML & MSG at once, just add a full folder of OLK file to the software and click on the export button. 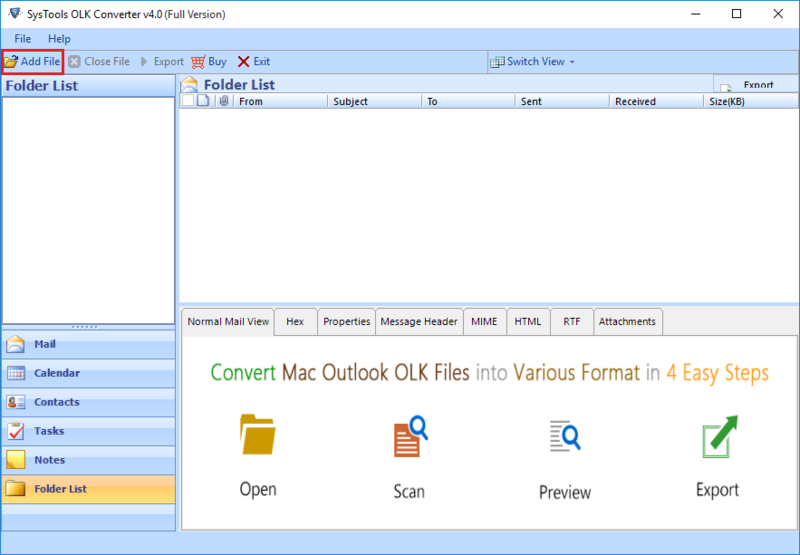 While saving the Outlook for Mac OLK14Message, OLK15 files to EML and MSG, the OLK file converter provides a feature to user that they can save these files according to their chosen names. Which means users can specify the name of resultant file according to their wish. This feature option is applicable on every OLK file. OLK14Message Converter offers a customization offer to convert OLK files which help users to export selective files. Option to filter OLK files according to date is available. You just have to specify “to” and “from” it defines the date range. The message between this specified data range will be converted from OLK15, OLK14Message to PST and EML. OLK files are the backend database files of Mac Outlook email application. Whenever there is any conflict in database. The Outlook fetch their information from OLK files to provide access of emails to their user. These are the replica files of Mac email client application data. These files are stored locally in the system and we can not access them directly in the Outlook without database. Note: As I mention in my previous post that the data of one email does not belongs to single OLK file. Multiple OLK files associated with email data in chunks. If we apply the above method, then we will not be able to find other files of that email. The reason behind that is every OLK file of a message contains some serial number and when we subtract one from that serial number we will able to find another OLK file of that message. If you drag one OLK file from the folder, it will automatically changed the serial number of all the files. Hence, you will not able to find other files of that message so, I will not prefer you to opt this solution. 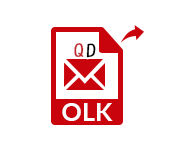 OLK Converter is the third party utility provided by QuickData. This tool can convert all OLK files from OLK14Message to PST and MSG. It also convert OLK15 file without any loss of data. Through this tool users can get-back their lost data. And able to access their data outside the Mac environment without any alteration. Step 1: Download and Install the software. Launch the tool from Start >> All program >>OLK Converter. Step 2: Select the OLK14Messages file from the local storage and click on Open Button. 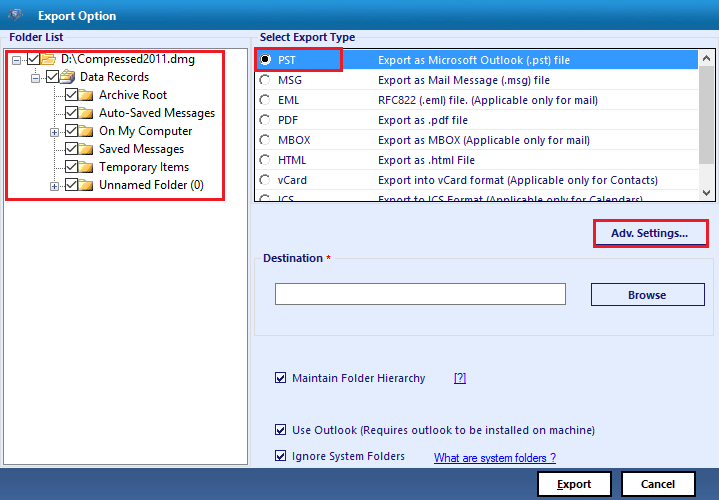 Add Folder - This option allows user to convert multiple Files within Mail Identity Folder. Step 5: Choose the output file from default option provided there, in which OLK15 messages need to be converted. Provide the destination to store the converted file and click on Export Button. 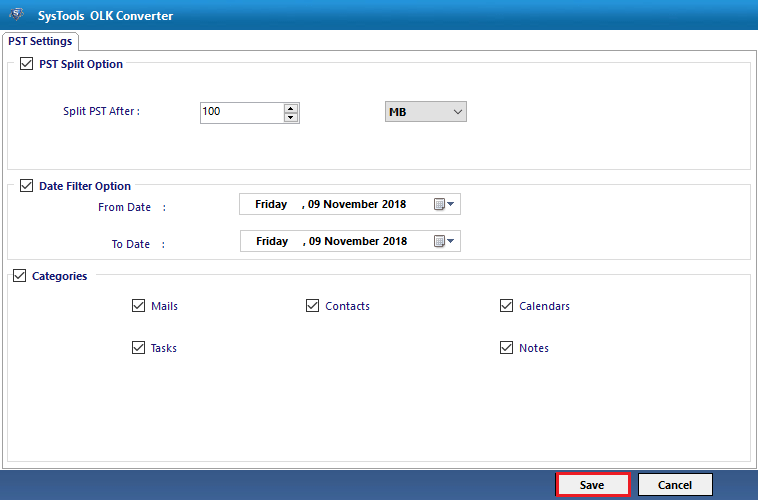 Step 6: After Selection of Export File format Click On the Advance Settings option to Select the "Mail Filter" in case if you want to filter emails. PST File Split Option in case of PST Export. You can also choose the categories from here.Then Click on save button to save your choice. Step 7: You will find the desired window prompt displaying the successful transfer of data. After completing data transfer you can view the Export Report for the conversion process. Is it possible to import OLK14Message to Outlook PST for Windows OS? Yes, The OLK14Message converter can easily convert OLK14Message to PST as well as it also export files in EML and MSG file format. Users can access these files in Windows OS without any restriction. My Outlook for Mac stores its data in OLK15 files. Does this software convert those files in PST? Yes, it also supports OLK15 files even this software almost supports all the files of OLK extension. Users can use this tool also convert their OLK14 Message file to PST or EML and MSG. After trying many methods, I failed to convert or recover my OLK14Message files. Then I looked out for a third party utility and Luckily I found this OLK file converter application. This tool gives me 100% satisfaction and convert OLK14Message to PST. Now I can access my Mac Outlook data without Mac. Thanks to QuickData team for developing this utility. I have some set of Outlook for Mac database file such as OLK15 and OLK14. And I only want to access these files on Windows operating system. 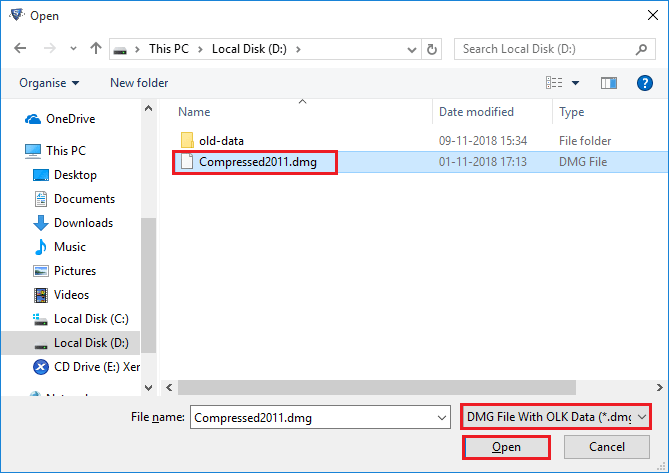 Then I use this OLK14Message conversion tool to convert my files from OLK to EML and now these files are accessible in Windows as well as in Windows OS without any difficulty. OLK14Message Converter is an ideal tool to export OLK messages to PST, EML or MSG format in Macintosh computers. It transfers OLK14/OLK15 email, event or contacts data and saves it to PST format. 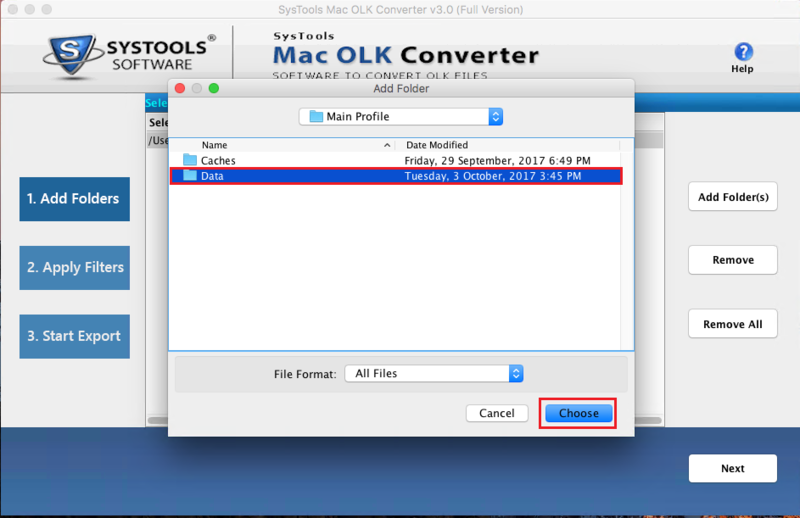 The Mac OLK Converter extracts message body from OLK message source and attachments from .olk14msgAttach file saves it to EML or MSG format. The OLK14Message Converter can export data from .olk14message, .olk14msgAttach, .olk14event, .olkMSGSource, .olk14contacts to PST format. Different parts of an email message are stored on different OLK files on Mac system. The OLK to PST Converter scans the OLK14/OLK15 folder and displays emails without any effect on data integrity. The Convert OLK14 to PST software is designed to capture the complete identity folder of Outlook for Mac. It reads the multiple .olk14Message and respective .olk14msgAttach files in bulk. The Convert OLK14Message to PST tool reads all OLK files and combines different part of OLK14Message. It then exports it to PST/EML or MSG format. There is an option provided by the Convert OLK14 to PST tool to apply a date-based filter to emails. This restricts the conversion process to a time period based on the date the emails were received. Just set a ‘to’ and ‘from’ date to selectively migrate emails. This saves time and prevents any needless migration of data. The OLK File Converter has optional folder hierarchy maintenance feature. Selecting this option makes sure that the exported PST, MSG or EML do not adhere to the original folder structure. The OLK14 to EML Export tool grants options to set different naming convention to exported files based on subject, date or a serial number. The OLK14Message to PST Converter is a reliable and relevant solution. A live progress report is generated containing details of email count, calendar items count and contact items count. The Convert OLK14 to PST tool report also includes the destination path, any failure count and progress status. Use the Mac OLK File Converter to save complete progress report at the end of the migration process. This file contains failure count with export status in CSV format. 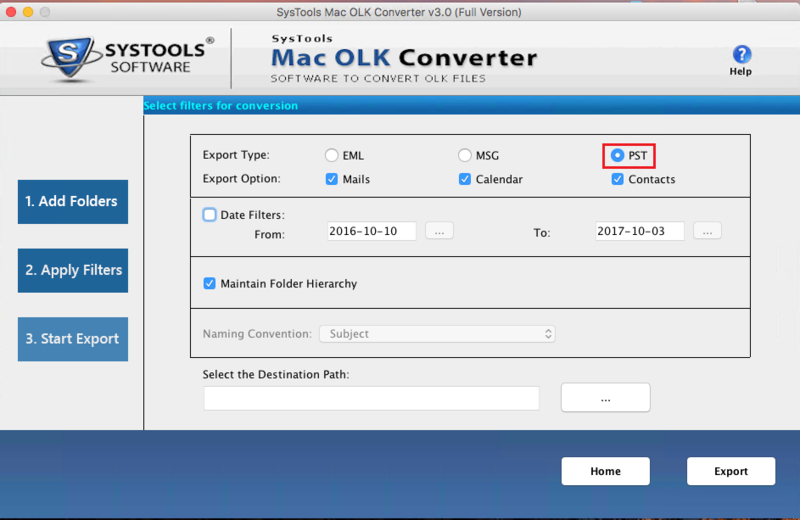 The OLK14Message to EML Converter works with all versions of Mac OS X 10.10 including OS X Yosemite 10.10.4 and 10.10.5. The tool also works with Mac OS Sierra Version 10.12.3. The Mac OLK File Converter is a basic tool to migrate Outlook profile temporary data to PST/EML or MSG format. In Mac operating system, each part of email messages is saved in different type of OLK files. The OLK14 Converter scans every type of OLK files and generates an email item from an OLK14Message. One can then convert it to multiple different formats to preview the message. Part of the email message is saved in the OLK14 Message file. The .olk14Message file is a backend data file used to store temporary data of Outlook for Mac profile. It stores only the message header data for user profile emails. The OLK to PST Converter reads each OLK14 or OLK15 message files without changing any data. Another part of an email message, the attachments are stored in .olk14msgAttach file. And the contents of an email message is stored in an OLK MSG Source in a .olkMSGSource file. The Convert olk14message to EML tool does not affect data integrity or email formatting or messages during transfer. These multiple OLK files containing different email message parts are all saved in the OLK folder. This is a temporary folder created by Microsoft Outlook client for a particular user profile. The OLK to PST Converter captures the complete OLK folder created by Outlook 2011/2016 on Macintosh operating system. It contains different OLK14 file types like .olk14Message, .olkMSGSource, .olk14msgAttach for attachments, .olk14event for calendar items and .olk14contacts. 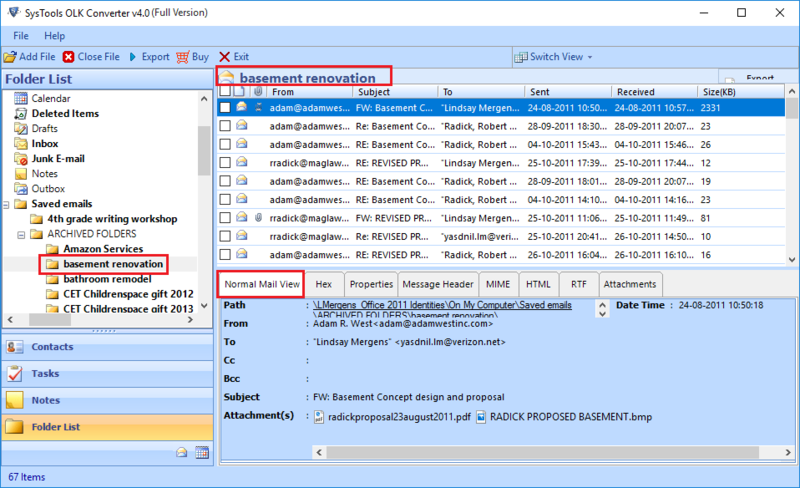 The OLK14Message Converter combines data OLK14 message, source and attachment file to export to PST/EML or MSG format. It has a simple interface and user-friendly graphics that can be understood even by a non-technical user. Export OLK14 to EML or MSG format with attachments easily, without any data loss. It exports complete OLK folder data containing messages, contacts, calendar items to PST format. Secure and Easy way to Convert OLK15message or OLK14message to PST. Ensures data integrity is maintained in extracting and saving different parts of emails saved in different OLK files. Free OLK to PST Converter for Mac tool export 25 items to PST. Step 1: Download and Install the software. Launch the tool from Start >> All program >>MAC OLK Converter. Click on Add Folders. Step 2: After selecting the OLK file, Click on Next. Step 3: Whole path of the OLK file will be visible. Click on Next. Step 4: Select the export option and apply date filters. Step 5: After that, Select the destination path for the Output file. Step 6: You can view the selected destination path. Click Export. Step 7: Then, You can view the status of Export Report of conversion process. Step 8: Click on View Report. Step 9: You can view the generated report in CSV format. Is Outlook installation necessary to perform the migration on a Mac machine? Yes, The Outlook 2011 or 2016 that comes with Office Suite needs to be downloaded and installed before performing this migration. Can the Convert OLK14Message to EML tool work on Windows Server machine? No, the tool can only work with Windows for home and business users with version 10 and below. Can the tool automatically upload a PST file directly to my new Outlook profile? No,the tool only creates an EML/PST or MSG file from current OLK15Message files. The Convert OLK14Message to MSG tool is a remarkable tool that worked wonders for our company. One of our employees had accidentally deleted Outlook 2011 for Mac profile. All that remained in the Microsoft Mail folder was this OLK folder. We had no idea until we came across this Mac OLK Converter. We recovered all emails and exported them to PST file without any changes to email data.